Not bad Adean; the concept is good. 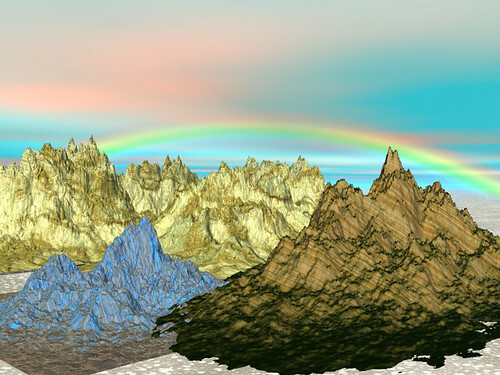 The sky/back rainbow/back mountains go well. Thanks. The Bear (my daughter) will be pleased to hear you both liked it. Also with regard to the dwarves….my wife (s) has pointed out that it is possibly “Fool’s Sapphire” (Cu2SO4)*5H2O….Someone on the Dwarven Scouting team would be in trouble if they came home with that!